If you love science then be sure to use this, our one-stop guide to NY science museums. If you'd like to learn a bit more about astronomy, biology, meteorology, physics and more then science museums in New York are the best place to go. You'll find the finest museums of science NY has to offer. 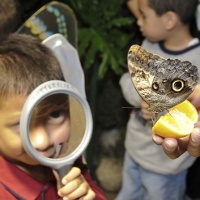 See Thousands of Specimens of Preserved Butterflies! While not solely a science museum, the natural science section of the Staten Island Museum is a fascinating look at nature. 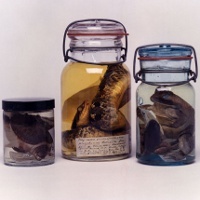 With over half a million specimens preserved for visitors' perusal this museum will delight people of all ages. See the huge lepidoptery collection, fossils from the cretaceous period and archaeological artifacts from 10,000 B.C. Various scientific disciplines are represented in the museum's exhibits and collections so whether you enjoy paleontology, botany, entomology or geology there is something for you at this NY science museum. A Great Science Museum in New York for Families! This three level science and learning center in Rochester has exhibits that will delight both children and adults. Interactive and hands-on displays aid understanding and learning while keeping the experience fun. Check out the museum's permanent exhibitions such as Light Here, Light Now, an optics exhibit, or Expedition Earth, a geographical exhibit that educates visitors about glaciers, weather and the rock layers that make up our planet. Temporary special exhibitions change regularly and highlight different aspects of the sciences. The Strasenburgh Planetarium which is attached to the museum shows original star and astronomy shows as well as exciting educational documentaries on its huge dome screen. A good place to visit for science lovers of all ages, this Buffalo NY museum is filled with interactive exhibits and fun displays. 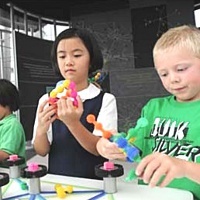 The Explorations Gallery is especially geared toward younger visitors - its brightly colored hands-on science displays will foster an interest in science from a young age. Other permanent exhibits includ Digging into Western New York's Past, an exhibit which features archaeologcial fossils and informatino from as far back as 11,000 years! Non-permanent special exhibits change regularly, creating delightful new places in the science museum each time you visit. 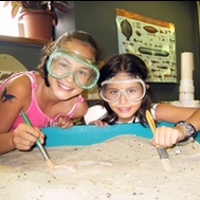 Numerous programs and events such as science lectures, museum camp-ins and science summer camps are available to the public at the museum. This interesting science museum in NY is open 7 days a week. Science Fans will Love This Hands-On Museum! Explore all the areas of science when you visit the New York Hall of Science. Located in Queens, this NY science center is filled with interesting exhibits and hands-on learning opportunities. The museum explores chemistry, biology, physics and astronomy in nearly 500 interactive displays. Permanent exhibitions include Marvelous Molecules, Search for Life Beyond Earth and Realm of the Atom where visitors of all ages can get a clear understanding of areas of science beyond normal perception. Open Tuesday through Sunday from September to March; open seven days a week the rest of the year. See the Universe as Never Before! This enthralling science center focuses on the universe in which we live. 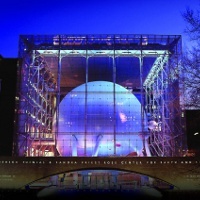 Most noticeable to visitors as they approach the science center is the large Hayden Planetarium - a huge sphere that dominates the center of the museum's glass enclosure. In the bottom half of the sphere is the Big Bang Theater where visitors can watch a short video about the speculated birth of the universe. Walking from the Big Bang Theater up to the Space Theater visitors will use the Cosmic Pathway - an exhibit which details the timeline of our universe's history. In the Space Theater, one of the world's top planetariums, visitors can watch a show and learn about the stars on the huge dome ceiling above them. The different rooms and halls display exhibits on various topics relating to geology, astronomy and cosmology. Learn about the Apollo Moon Landings, meteors and the stars at this amazing science museum in New York. This science center New York is a great place to bring the whole family. 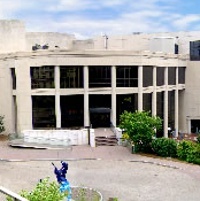 Whether you are a science enthusiast or have a passing interest in the subject, you will find the exhibits and displays at the Long Island Science Center fascinating. When you visit you will be able to view the interactive permanent exhibitions which demonstrate laws of physics, technology, engineering and mathematics. With a mission of promoting a love of science in all people, this museum hosts regular events and programs such as Family Science Days and school outreach programs. Open Sunday through Friday, this science museum is a great place to bring the family for an afternoon of fun. Visit a Famous New York Science Museum! Visit one of New York's most famous museums and learn about the scientific history of nature! This huge museum has displays and educational exhibits where visitors can learn about sciences such as anthropology, paleontology and zoology. Learn about meteorites and gems, see archaeological fossils from before recorded time and learn about earliest man. When you visit the butterfly exhibit you can see hundreds of specimens of butterflies fluttering around you - get a magnifying glass and see some up close! Special exhibitions change regularly and highlight different areas of nature and natural sciences. Visit the Rose Center for Earth and Space, next door, to learn all about astronomy and meteorology!